German publishing company Hamburger Automatenverlag found a brilliant new use for old cigarette vending machines — instead of icky cigarettes, the re-purposed “machines” carry a series of condensed novels, photo books, graphic novels and collections of poetry by local authors. The new initiative for book distribution is a throwback to the conventional vending machine and promotes literacy in a clever and charming way. 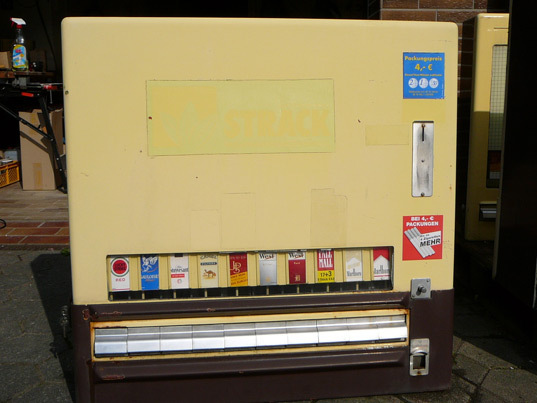 As smoking regulations keep getting stricter and prices continue to soar, the cigarette vending machines that used to be commonly found in convenience stores, restaurants and bars are now things of the past. The machines are valued for their robust mechanics however, and Hamburger Automatenverlag just needed to make a few small adjustments to transform them into book vending machines (a layer of paint, eye-catching graphics and some shiny new hardware). The machines request 4 euros in coins (approximately 5 US dollars), which is inserted into the front of the unit. Then, after a small tug on a spring-loaded knob, the requested book is dispensed. The restored vending machines are also part of a public art series that will be distributed around they city of Hamburg. Author Willard R. Espy had a similar idea back in 1963 and opened a business called "Charter Books." According to the "Talk of the Town" column in the April 18, 1964 "New Yorker" he had 350 machines that were dispensing 13 titles with sales averaging 1500 books a day. The machines were placed in subways, laundromats, supermarkets, bus terminals etc. in and around New York City. The books were mostly condensed non-fiction titles and sold for 25 cents each. He discontinued the business in 1966. Fresh healthy vending locations finding places to install your machines is made easily accomplished via our heavily national database of schools, shopping malls, health clubs, hospitals and office buildings where new Fresh Vending machines can be successfully operated. Hello Friends Your Blog Very Nice and blog Layout Very Nice update for your blog And Friends Main Point is Vending Machine Information very nice your blog and easy underside content your blog. I'm really impressed with this business venture Thanks For sharing. Love this idea, but in the interest of sustainability I hope readers don't treat these books as disposable! Very cool. I read an article several years ago about using these machines to sell small blocks of wood that had been painted by local artists. What a wonderful re-purposing project! 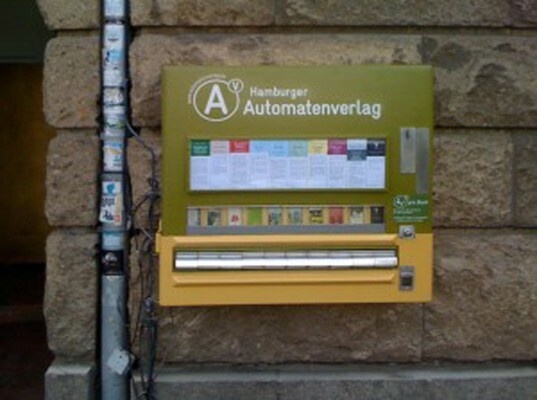 German publishing company Hamburger Automatenverlag found a brilliant new use for old cigarette vending machines -- instead of icky cigarettes, the re-purposed "machines" carry a series of condensed novels, photo books, graphic novels and collections of poetry by local authors. The new initiative for book distribution is a throwback to the conventional vending machine and promotes literacy in a clever and charming way.